Motor Vehicle Accidents in Workers Compensation | Zeiler Insurance Services, Inc.
Today’s cutting-edge technology allows cars to steer themselves, maintain safe following distances, brake automatically, and warn drivers of nearby vehicles. Yet, despite these safety improvements, motor vehicle accidents (MVAs) in the United States have generally been on the rise over the last several years. This troubling trend is also impacting workers compensation (WC). Though there has been an overall decline in WC claims, the frequency of claims for MVAs has increased in recent years. These accidents can be very severe and are responsible for a significant portion of fatal WC claims. So, what might explain this dangerous trend? A striking similarity in the growth and popularity of cell phone, and particularly smartphone, use over the same time period suggests that distracted driving may be a factor. 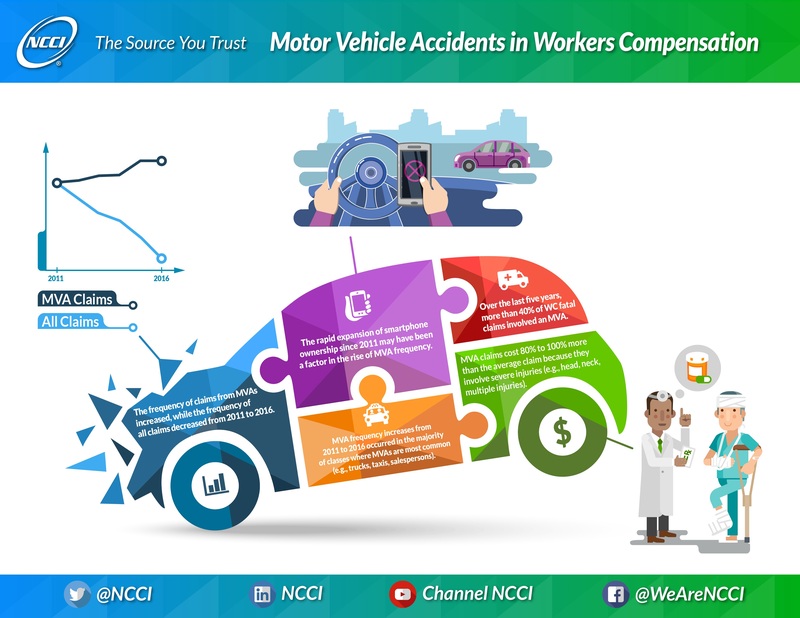 This NCCI Research Brief, “Motor Vehicle Accidents in Workers Compensation,” takes a deeper look at these issues and examines recent trends in the frequency and severity of MVA lost-time claims for all NCCI states combined. The study also looks at the classes most involved in this trend and factors affecting MVA frequency. The frequency of claims from MVAs increased, while the frequency of all claims decreased from 2011 to 2016. Workers compensation has experienced a long-term decline in overall claim frequency, thanks to automation, robotics, and continued advances in workplace safety. However, for WC MVA claims, the story is quite different, with frequency declining for many years and then suddenly turning upward. From 2000 to 2011, both overall claims and MVA claims were decreasing, but a noticeable divergence occurred in 2011. From 2011 to 2016, the frequency of all claims declined by 17.6%, while the frequency of MVA claims increased by 5.0%. MVA frequency increases from 2011 to 2016 occurred in the classes where MVAs are most common. As expected, certain classifications, which are predominantly based on the use of motor vehicles, such as truckers, taxi drivers, and salespersons, generate the majority of MVA claims. MVA claims cost 80% to 100% more than the average claim because they involve severe injuries (e.g., head, neck, multiple injuries). MVA claims tend to represent a higher share of the costliest claims. Over a five-year period, MVA claims accounted for 28% of claims above $500,000, versus just 5% of all claims. Over the last five years, more than 40% of fatal WC claims involved an MVA. An MVA claim is 12 times more likely to result in a fatality than a non-MVA claim. Will these efforts to reduce distracted driving be successful? What other solutions might the future hold? NCCI will continue to closely monitor trends in MVAs and share our findings. View the complete research brief, "Motor Vehicle Accidents in Workers Compensation (PDF)"